How to describe this book? In a word – savage. For those regular Librivox Le Queux mystery listeners, this book is a step in a different direction by the author. The book starts out like most Le Queux. Our hero, Richard Scarsmere, befriends an individual (Omar) at an English boarding school who turns out to be an African prince from a kingdom called Mo. Omar receives a visit from one of his mother’s trusted advisers. 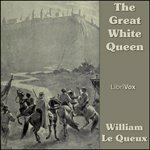 His mother, the Great White Queen, seeks him to return home immediately. Omar convinces Scarsmere to return to Africa with him since there is little opportunity awaiting him in London. What follows is a tale of deceit, treachery, barbarity, and mystery. Listen Now! Click on a chapter to start the audio playback.